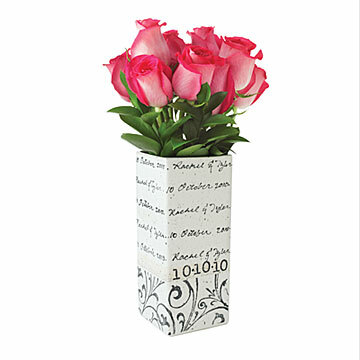 This elegant vase is adorned with a couple's names and wedding date hand-written in ornate cursive. Blenders, waffle irons, and baking pans all come in handy for young marrieds, but may not quite deliver the special statement you're looking for (especially when your blender gift is one of five at the shower). Sheree Burlington's personalized wedding vase is a pretty, but practical way to commemorate the special couple. Submit the bride and groom's names and the wedding date, and Burlington will hand-write them in cursive on a white, earthenware vase. The look is stylishly vintage, and the effect is subtle, making this vase perfect for everyday use in the recipients' new home. Handmade in New Hampshire. 4" L x 4" W x 10" H, 64 fl. oz. Two first names (10 character max for each name) and date, hand written in cursive, repeated as space allows on front and back. Stamped numerical date will read 2 digits per month, day & year(ie: 11.17.10 MM.DD.YY) The handwritten portion will read as: 17 November 2010. Second time as great as the first! I'm a budget shopper, so this is a splurge for me...but oh, so worth it!!! Different gift for someone who has all the necessities. I sent it as a wedding gift to a friend of my daughter who recently married. Her registry was pretty much picked over by the time I got around to buying a gift. I saw this on my internet search for an unusual gift and was so impressed as it is unique and versatile. Will look great just as dÃ©cor on a shelf or holding flowers on the dining or serving table. This was a wedding gift for a close friend and his wife, and they said this was one of the best gifts they received. It's personalized while not being cheesy or tacky, and it's an absolutely beautiful vase. It's tasteful and thoughtful, perfect for a close friend that deserved something way more unique than just something off the registry! 10/10 would buy again. This was a wedding gift and it exceeded my expectations - lovely and personal. It was a gift, so they can use it however they want. I've been giving my sister and b.i.l. "traditional" wedding anniversary gifts since year 1. Pottery is year 9 so this fit the bill perfectly and was a nice way to commemorate them and their special day nine years ago.